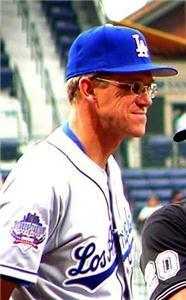 Former Chattanooga Lookout manager Jim Tracy - second year manager of the LA Dodgers - placed fourth in the balloting. Tony La Russa added another line to his already robust resume on Wednesday, picking up Manager of the Year honors in the National League. It was the fourth time La Russa has been named Manager of the Year by the Baseball Writers Association of America, the most in the history of the award. La Russa also joined Bobby Cox as the only men to win the award in both leagues. Cox has always been known as a players' manager because of his ability to remain faithful to them. His enduring confidence in his team this year helped the Braves overcome a start that saw them win just 19 of their first 40 games. "I think consistency and patience are what set him apart from any other manager," pitcher Greg Maddux said. "He's very good at picking his team out of Spring Training and sticking with it." Cox's patience with his players began to provide dividends on May 15. From that point the Braves reeled off 60 wins in their next 80 games, all but assuring themselves of another NL East title by early August. Despite his run of success with the Braves for more than a decade, Cox has been recognized as Manager of the Year just once during that time. He also received the honor in 1985, while he was in the AL with the Blue Jays. Earlier this month, Cox was named NL Manager of the Year by The Sporting News . He has won that award, which is voted on by fellow managers, a record five times. The Cardinals won 97 games in 2002, the franchise's highest total since 1985, and made the playoffs for the third straight season. St. Louis has won or tied for the NL Central crown in each of those three years. Making the accomplishment all the more impressive were the obstacles that the Cardinals had to overcome. * Six different starting pitchers spent time on the disabled list. Nine pitchers made at least 10 starts, and 14 men started at least one game. * On the offensive side, outfielder J.D. Drew, expected to have a breakout season, was slowed all year by a knee injury. First baseman Tino Martinez struggled in his introduction to the National League. * All that pales in comparison to the biggest challenge: the stunning death of star right-hander Darryl Kile on June 22 in Chicago. Kile died in his hotel room overnight before a scheduled Saturday afternoon game. The blow was especially hard to take because that same week, Hall of Fame broadcaster Jack Buck had passed away as well. But the team was back on the field a day after the loss of Kile, and back in the win column three days after that. The Cardinals always acknowledged that there was a job to do, and they did it admirably. Despite the loss of a man who was friend, teammate, clubhouse anchor and star pitcher, the Cardinals took off in the second half and ran away with the division by 13 games. The honor caps off a year of accomplishments for La Russa, who is disdainful of managerial records. He climbed from 11th to eighth on the all-time wins list, ending the year with 1,924 and passing Bill McKechnie, Gene Mauch and Casey Stengel on the way. La Russa also joined Sparky Anderson and Leo Durocher as the only manager to win 600 games with two different teams. Mike Scioscia was voted AL Manager of the Year on Wednesday for leading Anaheim into the playoffs. In voting conducted before the start of the postseason, Scioscia received 17 first-place votes, 10 seconds and one third for 116 points from a panel of the Baseball Writers' Association of America. In his third season as Anaheim's manager, Scioscia turned around a team that went 75-87 in 2001, finishing 41 games behind Seattle. The Angels overcame a 6-14 start to go 99-63, finishing four games behind Oakland but winning the AL wild card. Anaheim then beat the Yankees and Twins in the playoffs, and the Giants in the World Series. Art Howe, who left Oakland after the season to become manager of the New York Mets, was second in the AL with nine first-place votes, five seconds and 14 thirds for 59 points.